After making my first Diamonds, kites and stars cushion someone suggested that I should enter it in to the Pantone Quilt Challenge. Unfortunately as I'd started making it last year it wasn't a candidate for submission, so I resolved to make another one to enter. Rather than bore myself senseless by making an exact replica I went for a different colour scheme. The Radiant Orchid was a prerequisite (being the Pantone colour of the year) and I decided to throw blue and green into the mix this time. 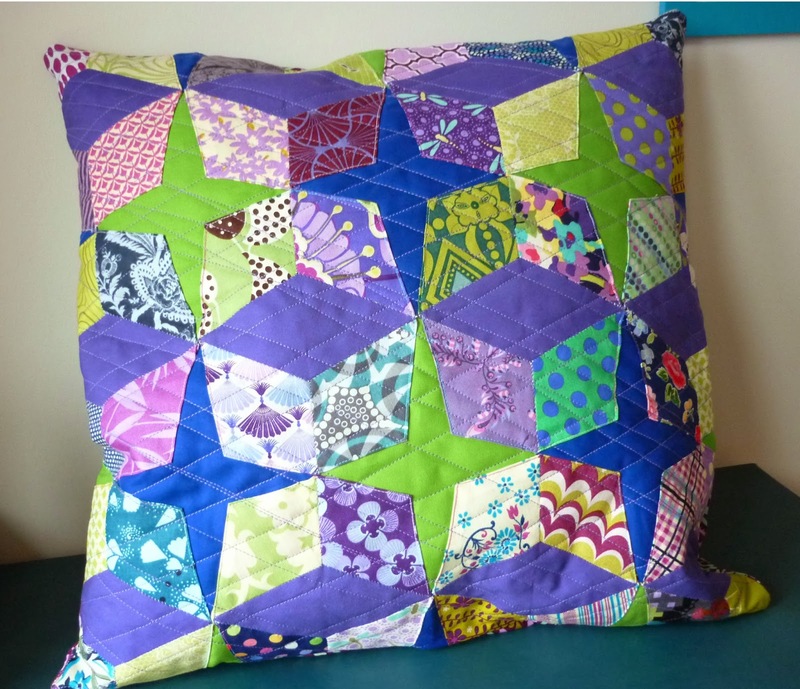 Edited to add: This cushion finished up around 18" square :) Free pattern now available here. definitely would love to have a go. It is a really interesting design. These look fun. I prefer the pink colours to the blues. A pattern would be too. They go really well together and I think it would make a great kit. The crazy straight line method of quilting has never crossed my mind, why is that? I'm going to echo others here and say definitely post a pattern! :) I love both versions of this design! One is more sunset and the other is more twilight, and both are beautiful!